Coca-Cola’s VitaminWater is being marketed as a healthy, hydrating drink. The company claims that the drinks prevent chronic diseases, reduce the risks of eye diseases, promotes healthy joints, and supports optimal immune function. However, nothing could be further from the truth. the product is basically sugar-water, to which about a penny’s worth of synthetic vitamins have been added. And the amount of sugar is not trivial. 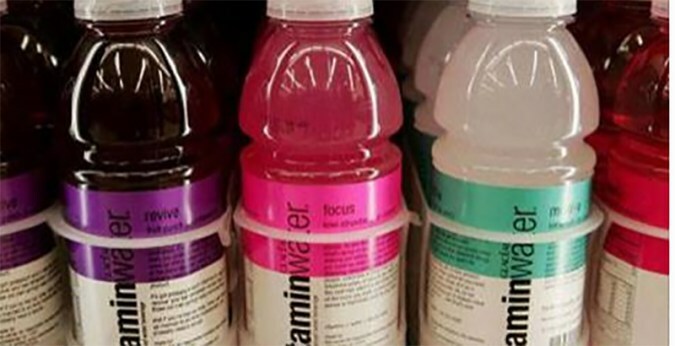 A bottle of vitaminwater contains 33 grams of sugar, making it more akin to a soft drink than to a healthy beverage. citric acid, magnesiumlactate and calcium lactate and potassium phosphate (electrolyte sources), natural flavors, vitamin C (ascorbic acid), gum acacia, vitamin B3 (niacinamide), vitamin E (alpha-tocopheryl acetate), vitamin B5 (calcium pantothenate), glycerol ester of rosin, vitamin B6 (pyridoxine hydrochloride), vitamin B12, beta-carotene, modified food starch, sorbitol. Crystalline fructose is produced by allowing the fructose to crystallize from a fructose-enriched corn syrup. So basically, it is made from corn syrup, and not only corn syrup, but “fructose enriched” corn syrup. Crystalline Fructose contains 99.5% minimum of fructose assay, which is a greater higher percentage of fructose than what makes up high fructose corn syrup. Crystalline fructose may be contaminated with arsenic, lead, chloride and heavy metals. This type of fructose leads to increased belly fat, insulin resistance, and metabolic syndrome. Large amount of fructose can create a fatty liver and cirrhosis as it can not be processed completely in the liver. The fructose interferes and alters the metabolic process in our cells, which causes oxidative damage. Synthetic vitamins are useless in our bodies as they are often synthetic derivatives that aren’t readily broken down, absorbed and utilized by the body. They are usually manufactured at high temperatures and contain artificial or toxic ingredients, such as dyes, preservatives, coal tars, sugars, starch, and other additives. Organic Consumers (www.organicconsumers.org) warns people against these chemically produces vitamins as they can consist of petrochemical derivatives, nicotine and coal tars (by-products of coal). Additionally, some Vitamins such as A and E are not water soluble (that means that your body cannot flush out the excess). Thus, taking more than needed is very dangerous for your health. It leads to toxic built up and consequently to health problems. Synthetic Vitamins havebeen shown to leach nutrients like calcium and magnesium out of the bones. Artificial food coloring is a serious problem both for children and adults. According to the Center for Science in the Public Interest, all of these contain potential cancer-causing chemicals and most of them can potentially cause severe allergic reactions. Real water is the smartest choice. It is crucial to keep your body properly hydrated at all times, and pure water is the only way to do this.